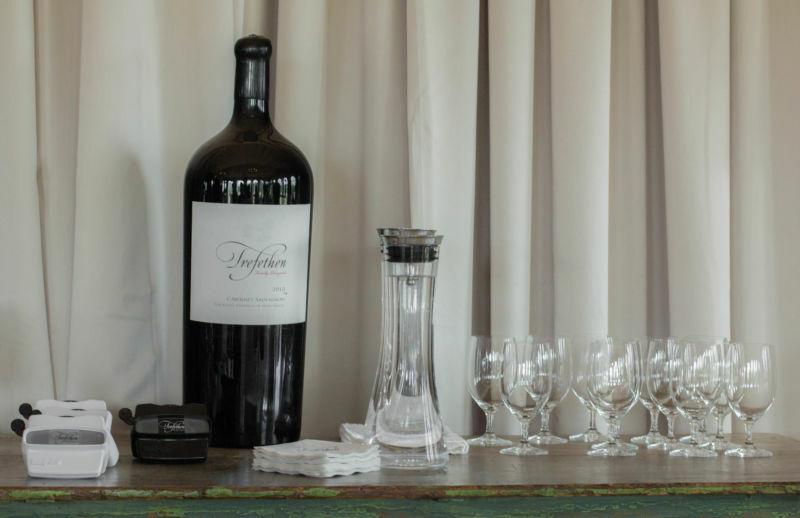 Trefethen first came to my attention in the aftermath of the 2014 Napa Earthquake, with the winery suffering severe damage to the nineteenth century building in which it held its tastings (See the article and picture). They are working on repairing the building, but for the last eighteen months they have used a temporary structure to hold tastings. We visited on a recent weekend after eating lunch at Bistro Don Giovanni, which is a single junction away on Highway 29. The tasting is in a tent, but do not let that word imply second-rate accommodation. The floor is carpeted, chandeliers hang from the roof, there are windows in the tent wall, and a fountain splashes softly in the centre. Given the style that they applied to this temporary space, I am looking forward to revisiting when they move back to their reconstructed building. California Girl: I have to admire the way the staff carries on despite the conditions of the situation. I thought the atmosphere was lovely even in a tent. I am looking forward to seeing their newly rebuilt tasting room. The tasting on offer was to pick any five wines from a menu that listed a dozen options. Fortunately, there were three of us tasting on this day, so we could sample all the wines. I started with the 2014 Dry Riesling ($25). It spends twenty-eight days in stainless steel. It has extremely low residual sugar (0.06). I detected lemon on the nose and tasted apples with a hint of lime. This is a good example of how to confound those who think of Riesling as a sweet wine. California Girl Comments: This had a clean flavor on the palate with heavy citrus and acids on the finish. California Girl Comments: Quandary 2015 – This is a very unusual white blend. 50% Chardonnay, 30% Riesling, and 20% Sauvignon Blanc. It had a beautiful nose full of pears and vanilla. On the palate, it is fruity and smooth. We really enjoyed this wine. The 2013 Pinot Noir ($45) spends ten months in oak. I was greeted by a classic Pinot nose. It was extremely light in colour; I have seen rosé wines darker than this. There was an enthralling rich smokiness in the back of the mouth. California Girl Comments: This wine was good but not at all great for the price point. It was a bit rough and heavier than most Pinot Noir. The 2012 Merlot gave me a nose of rich berry. There was beautiful mixed fruit on the palate, but the tannins were still strong with this one; it will need some time to age. California Girl Comments: Gorgeous nose of blackberries and spices. The flavor was rich and round. It needs about 3 years of aging to get the true flavor of this wine. The 2013 Dragons Tooth ($60) had the colour of velvet cake, an outstanding nose of vanilla, and berry. The taste was a beautiful balance of fruit, medium acidity, and soft tannins. California Girl Comments: Smooth and rich with a soft dry finish. I really liked this wine. The 2012 Cabernet Sauvignon ($60) spends twelve months in new French oak, another four in American oak, and a final month in Hungarian. The nose was an inviting mélange of fruit. It was a very easy drinking Cab, with the tannins surprisingly soft for the a wine so young. We also tried the 2011 version of this wine. The server described 2011 as a challenging year; a refrain we hear repeated, often verbatim, by other Napa winemakers. It was no match for the 2012. California Girl Comments: Nice fruits on the palate, with good construction. 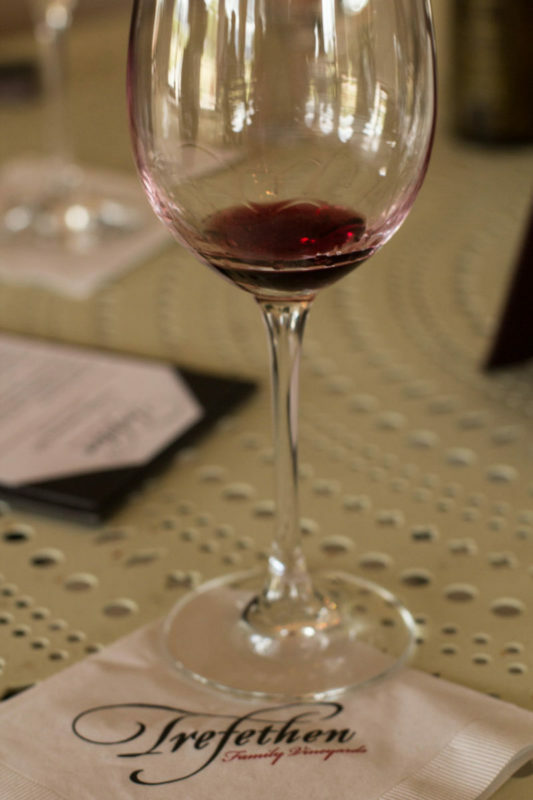 The 2012 Reserve Cabernet Sauvignon ($115) is their one wine in which not all the grapes come from the estate that surrounds their tasting room. They are grown in volcanic soil further North in Napa Valley. It spends twenty months in new French oak. The nose was a great balance of fruit and vanilla. In the mouth there was a well-moderated spiciness, combined with medium acidity. The tannin initially seem tamed, but crept up in the aftertaste. As one would expect, this wine needs age, but is showing promise. California Girl Comments: Glorious smell, the flavor of plums with a gritty texture. This wine needs at least five years to really reach its full potential. Trefethen charges $25 for tasting. This fee is waived on purchase of a case of wine. Reservations are required.